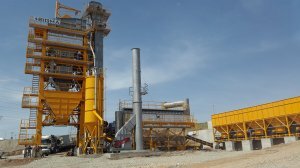 240 tons/hour Sigma asphalt plant has been commissioned in Arbil/Iraq. As requested by the customer, the plant has two combustible lines and it is delivered ready to work with both fuel oil and diesel. The plant will produce asphalt for the road projects in and around Arbil. Also, the plant is equipped with bitumen and PMB tanks with 50 tons capacity each, and a 85 tons capacity double hot-mix silo with two separate compartments for storing different types of asphalt. The plant is completely automated and computer controlled with the in-house made SIGMA automation system.